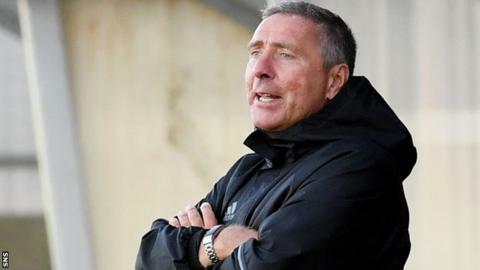 Peterhead stretched their lead at the top of Scottish League Two after beating Elgin City by a single goal. Patrick Boyle struck early on and Elgin could not recover. Clyde beat Edinburgh City 1-0 to leapfrog the capital side into second place. Annan Athletic maintained their push for the play-offs by beating Queen's Park 2-1, Stirling Albion overcame Cowdenbeath and bottom side Albion Rovers drew with Berwick Rangers. Boyle's eighth-minute goal settled Peterhead's nerves at Balmoor but they could not add to their lead. It took a second-half David Goodwillie penalty to separate Clyde and Edinburgh City, awarded after he was fouled by Liam Henderson, and the Bully Wee had Tom Lang sent off for two bookings. Tony Wallace scored either side of half-time to put fourth-placed Annan in control against Queen's Park, David Galt replying for the Spiders. Darren Smith headed Stirling in front against Cowdenbeath but was then sent off before David Cox fired the hosts level. Peter MacDonald put Albion ahead again and this time Cowden could not recover. Albion Rovers remain eight points behind Berwick after the latter struck late at Cliftonville. George Newell fired Rovers in front on the quarter-hour mark but Calum Adamson equalised with three minutes left.